Heat oven to 350°F. Lightly grease or spray cookie sheet. In large bowl, mix chicken, shallot, gingerroot, 1 tablespoon brown sugar, 2 tablespoons bourbon, 3 tablespoons soy sauce and the bread crumbs. Shape into 16 meatballs, using about 2 tablespoons mixture for each. Place on cookie sheet. Bake 20 to 25 minutes, or until thermometer inserted in center of meatball reads 165°F. Meanwhile, separate each biscuit into 2 layers to make 16 dough rounds. Place 1 spinach leaf and 1 meatball on each round. Wrap dough around meatball, and pinch dough to seal. On lightly greased cookie sheet, place about 2 inches apart. Bake at 350°F 20 to 25 minutes or until golden brown. Meanwhile, make sauce. In 1-quart saucepan, mix 1/2 cup bourbon, 2 tablespoons soy sauce, the vinegar and 1/2 cup brown sugar. Heat to boiling; reduce heat to medium, and cook 11 minutes. Dissolve cornstarch in water; add to sauce and heat until thickened. Garnish sauce with chopped green onions. 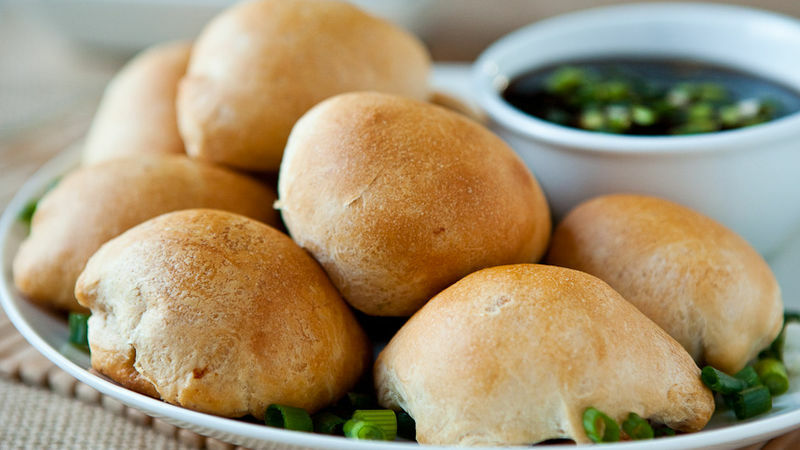 Serve with bourbon chicken balls. To prevent meatball mixture from sticking to your hands, wet hands lightly with cold water before shaping balls. Did you forget the shallot? No problem--1 1/2 teaspoons grated garlic and 1 1/2 teaspoons grated onion can be substituted for the 1 tablespoon grated shallot in this recipe.